Climate change is placing seven ‘cross pressures’ on businesses, which makes it the biggest market disruptor in the years to come. This will create a new market reality with new winners and losers. Winning the game is about innovative solutions, daring strategies, and new mindsets. Expect that the next 1,000 days will decide if you win or lose the climate game – the game that might be the biggest business disruptor for generations to come. 1,000 days to transform a company or change strategies is not a proven and scientific fact, it just illustrates the accelerating turbulence in global markets. A fast glance over the past few years with new digital breakthroughs, escalating political and financial turmoils, threatening climate changes, and our commitment to fulfilling 17 Sustainable Development Goals indicates what is ahead of us. We are facing a period with exponential changes – changes that will challenge our basic ideas on how to develop societies and run businesses. Some sectors and corporations may not have 1,000 days to adjust. 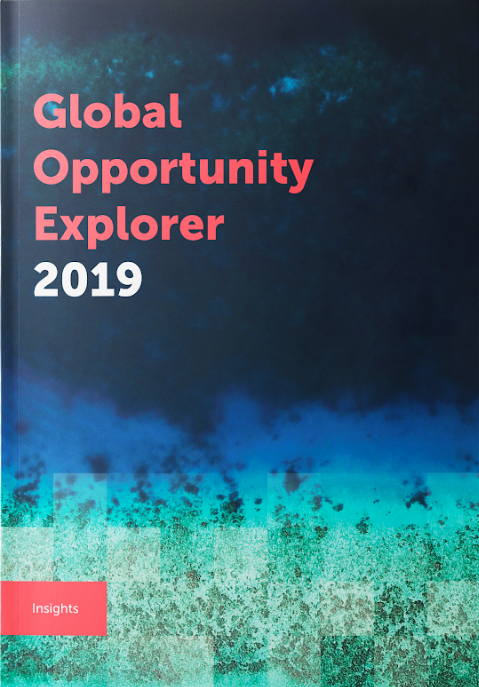 Global Opportunity Explorer 2019 Insights argues that climate change will be the biggest market disruptor in the coming years – for a couple of reasons: 1) Climate change calls for urgent and systemic cross-sector solutions. Neither the private or public sector can solve complex challenges like climate change alone. It takes new partnerships and market clusters. 2) Climate change is a risk multiplier, strongly interconnected with all other Sustainable Development Goals. Even if climate action is just number 13 among the global goals it interferes with the remaining 16. Successfully realising all of the goals fundamentally depends on the outcome of the climate war. One thing is that the physical climate is facing dramatic changes. But so is the business climate. Climate change is already challenging and even ‘endangering’ the future of many businesses and sectors. But at the same time, climate change is creating a range of new business opportunities, market possibilities, and business alliances – it is a game with new winners and losers. It all depends on how fast each corporation “translates” the signals of climate change in due time. Challenges of this magnitude call for new approaches. We have to reinvent business models and public-private partnerships, scale up research and development, and motivate governments and businesses to interact closely to develop innovative regulations to support new types of solutions. The market for climate solutions is huge and difficult to measure by exact numbers. The need for developing and implementing fast solutions was strongly documented over the past year. Not only by new heat records, but through a series of scientific analyses and reports, all stating that we might have lost the battle for a 2°C temperature rise but are heading for 3-4°C. DNV GL’s latest Energy Transition Outlook predicts that even with a fast transition to renewables, we will most likely end up with a 2.6°C increase above pre-industrial levels by the close of this century. Other credible scenarios predict a truly catastrophic 4°C, or even higher. Challenges of this magnitude call for new approaches. We have to reinvent business models and public-private partnerships, scale up research and development, and motivate governments and businesses to interact closely to develop innovative regulations to support new types of solutions. These kind of partnerships are convincingly spelled out in the UN Global Compact’s new initiative “Ambition Loop”. See article by Lise Kingo page 12. The perspective is not only interesting, it is crucial. Without governments’ support and the development of stable and long-ranging frameworks we cannot win the climate battle. In this publication we have looked into six sectors which are strongly affected by climate changes. They include connectivity, energy, finance, built environment, mobility, and food. We outline why each sector can be a market game-changer – and are all supported by a number of concrete solutions. The estimates of the total market value of the six sectors exceeds trillions of dollars – economic opportunities that can be realised over a relatively short number of years. It might foster new types of climate entrepreneurs and companies, and turn the old market structures upside down – unleashing what could be remembered as a climate-market revolution. But the ticket to these market opportunities is a new business approach. Any company and executive has to understand and react to seven cross pressures that will change the rules of the game. 1) New political pressure: To achieve the commitments of the Paris Agreement, most governments will increasingly, in some cases drastically, introduce new regulation favouring more sustainable business and market growth. These regulations will increasingly favour climate-friendly business. Some countries are setting deadlines to phase out fossil fuels, or incentivise sales of electric vehicles. 2) New resource pressure: The demand for many crucial resources is growing rapidly, and climate change is putting a great strain on natural resources – for example water and food. In many cases we might experience a lack of various resources, making prices surge and forcing businesses to look for new kinds of resources. 3) New consumer and employee pressure: Consumer choices are becoming increasingly ethical and climate-conscious, and that trend will only grow as the climate challenge is more broadly understood and accepted. Talent will increasingly be attracted to jobs and companies that are operating sustainably and with a purpose, shown clearly by the millennial generation’s job preferences. 4) New market pressure: Alternative and new ‘climate-safe’ products and markets are emerging everywhere, with a rapid rate of innovation. These new alternatives are developed by incumbents as well as start-ups. 5) New technological pressure: Digitalisation is one of the most disrupting factors in the 1,000 days to come. It might too be the most rapid and efficient weapon in the climate war deciding who will win and who will lose. 6) New investor pressure: Sustainability is gaining ground in the minds and wallets of investors. The trend is that they will gradually steer away from the environmentally harmful sectors and businesses, as these will increasingly be perceived as risky territory. 7) New time pressure: Companies need to adapt to the new market reality within a very short time frame. New companies will arise and prosper faster than ever, and old, well-established companies will fade and fold faster than ever. The difference between a risk and an opportunity is how soon you discover it. And the climate game is a fast game. This market reality will no longer be driven only by the traditional and well-established markets. All corporations must rethink their missions, strategies, products, and services in order to thrive in climate-disrupted times. The sectors, industries, and companies not able to respond to the risks brought about by climate change will lose – maybe not tomorrow, but they will lock themselves into a trajectory that will make them disappear in the years and decades to come. The most obvious examples comes from the fossil fuel industry – the companies working with coal, oil and gas. Here we are already witnessing new political regulation, investors pulling back their allocations, and new industries and technologies challenging the market with renewable alternatives – and looking ahead this pressure will only grow if you take the global political commitments for face value. Thus, companies within this sector face a stark choice of working progressively to diversify, or face inevitable long-term decline. The elimination race is already happening. A series of new companies fit to grow in the climate-driven markets are mushrooming and new solutions, alliances, and markets are starting to see the green light. Many of the world’s biggest companies are already trying to adjust themselves to the new market reality. But the fossil fuel companies are just one example out of many. There are a number of business sectors and companies next in line – those who are also not prepared for imminent political regulation, still putting great pressure on global resources, and not looking closely enough at the development of consumer demand trends. The elimination race is already happening. A series of new companies fit to grow in the climate-driven markets are mushrooming and new solutions, alliances, and markets are starting to see the green light. Many of the world’s biggest companies are already trying to adjust themselves to the new market reality. Today nearly half of the Fortune 500 companies have set clear energy targets or greenhouse gas reduction goals. Now the challenge is to fulfill them and encourage the other half to follow suit. The winner takes it all, and the loser stands small’ – or disappears. There is no doubt that climate change is the biggest challenge ever and no doubt either, that it can be turned into the biggest opportunity ever. It is all a question of mindsets. Numerous reports and analyses document both challenges and potentials. To win or lose the climate game is a question of mindsets and the innovation power in boardrooms and executive suites. When sustainability became a hot issue, many of the large companies hired sustainability officers, established sustainability departments, and issued sustainability reports – and the company could demonstrate its sustainable profile and brand. But that was yesterday. Today and tomorrow climate change and the 17 Sustainable Development Goals have to have top board priority and decide the overall strategy of the company and its core values. Any company failing to meet these criteria will be among the losers. And any company embracing this concept is a potential winner. Therefore conquering and benefitting from the expanding climate markets will not be a competition between types of companies but types of executives and mindsets. 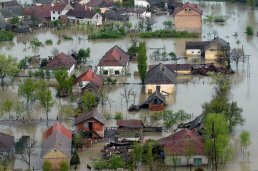 Here only the right mindsets can turn climate risks into climate opportunities. Erik Rasmussen Founder of Sustainia and Co-Founder of the Global Opportunity Explorer. Sustainia help clients develop successful sustainability strategies, amplify sustainability brands, and communicate effectively. As one of the world’s leading communicators of sustainable solutions, we serve clients of all sizes and from all corners of the world. Since 2009 Sustainia has narrated thousands of stories about the best sustainable solutions from around the world.